Energy giant BP has been accused of hiding key data needed to investigate the Gulf of Mexico oil disaster. Transocean, the company that owned the oil rig, alleged that BP is refusing to hand over information it needs about the explosion. The claim is made in a letter from one of Transocean's lawyers sent to members of President Barack Obama's cabinet. BP rejected the allegation, saying the letter contained "misguided and misleading assertions". Nevertheless, the claim risks piling further pressure on BP, which has borne the brunt of political and public criticism for the disaster on 20 April which killed 11 workers and caused the worst oil spill in US history. In the letter, Steven L Roberts, lawyer for Transocean, writes: "BP has continued to demonstrate its unwillingness, if not outright refusal, to deliver even the most basic information to Transocean. "This is troubling, both in light of BP's frequently stated public commitment to openness and a fair investigation and because it appears that BP is withholding evidence in an attempt to prevent any other entity other than BP from investigating," he wrote. According to a report by the AFP news agency, the letter was sent to members of Mr Obama's team and leading Members of Congress. 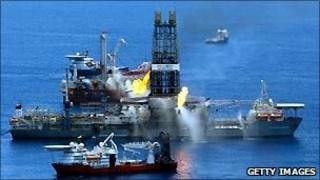 Transocean is facing 249 lawsuits for damages over the disaster. The company has asked a court to limit its liabilities to $27m (£17.3m), saying it was not responsible. A scientific study of the effects of the spill, meanwhile, has confirmed the continued presence of a toxic chemical residue one kilometre below the sea surface. The investigation, carried out in June by the Woods Hole Oceanographic Institute, shows a plume of crude oil-based chemicals up to 200m high and 2km wide, extending 35km from the spill site. In a statement, BP said it was "unequivocal and steadfast" in its commitment to discover why the Deepwater Horizon rig exploded. "We are disappointed that Transocean has opted to write a letter with so many misguided and misleading assertions, including the assertion that BP is 'withholding evidence'" on the explosion and spill. "We have been at the forefront of co-operating with various investigations commissioned by the US government and others into the causes of the Deepwater Horizon tragedy," BP said.